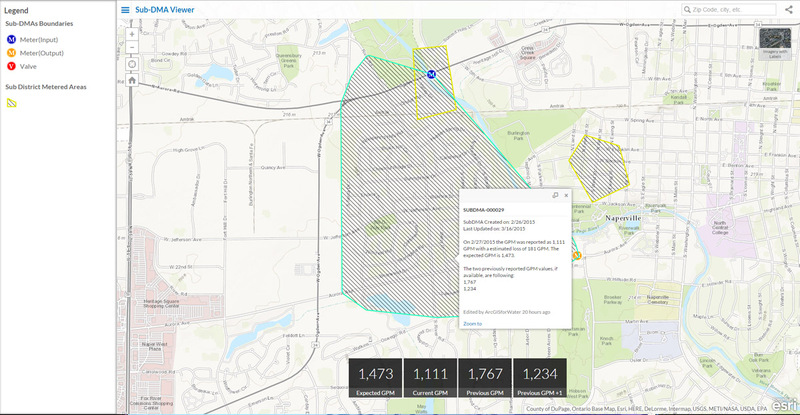 A view of Esri's Nighttime Flow Analysis shows a sub-district metered area outside Naperville, Illinois. The viewer helps decision makers compare flow in expected and actual gallons per minute to help identify leaks. Redlands, California—Esri this month announced the release of its Nighttime Flow Analysis solution. This COTS configuration of Esri's ArcGIS platform helps water utilities identify areas with underground leaks and other sources of nonrevenue water loss. "This solution really highlights how ArcGIS can be used in a holistic workflow at a utility," Esri solutions manager Michael Miller said. "Utilities can quickly show a return on investment from managing an accurate asset database." The return on investment from Nighttime Flow Analysis comes from utilities finding and fixing underground leaks and other sources of water loss that could go undetected, sometimes for months. Repairs lead to less unnecessary water loss, better service, more efficient distribution to customers, less wear on treatment equipment, and longer-term value from capital-improvements spending. "Over the long term, Nighttime Flow Analysis improves the utility's operations and capital planning through narrowing down the areas of high water loss," Miller said. "This can cut repairs from months to weeks or even days, and it can even prevent service disasters." Nighttime Flow Analysis works by using an optimal time to analyze for leaks. This is typically at night, when household water consumption is significantly low. At the lowest point, the observed GPM from the area is entered into the solution. By comparing this observation to the expected flow, the utility can iterate through different Sub-DMA configurations without creating permanent DMA’s to determine potential nonrevenue water loss, or water that flows somewhere but isn't reaching a meter. Learn more about Esri's ArcGIS for Water Utilities at solutions.arcgis.com/utilities/water.